It got a little tense on Sunday afternoon but Team Europe have regained the Ryder Cup despite a brief fightback from Team USA. Jim Furyk's men led 3-1 after Friday morning's fourballs and Europe were matched at a high of [4.0] in the Ryder Cup winner market, but astonishingly Thomas Bjorn's men won the next seven completed matches, taking a 8-4 lead into Saturday's foursomes. Stars of the show were Tommy Fleetwood and Francesco Molinari, and the European dream team would make it four wins out of four in the afternoon fourballs, a session that was shared 2-2 meaning Europe led 10-6 going into Singles Sunday. Bjorn stacked the top order with his star men, McIlroy, Casey, Rose, going into the Singles, but all three failed to win and at the time when the first few games were finishing the projected score was just 15-13 and Europe had drifted out to [1.24] in the Winner market. But as further points were added to the USA total thanks to superb wins by Webb Simpson and Tony Finau, Europe's odds to win the Ryder Cup shortened seemingly with every single shot played because of the strength they were putting themselves in further down the order. Wins for Thorbjorn Olesen and John Rahm put Europe in total control, and with the likes of Henrik Stenson and Molinari comfortably ahead in their matches, Team Europe were on the brink of victory and they were trading at the minimum odds of just [1.01] to regain the Ryder Cup. 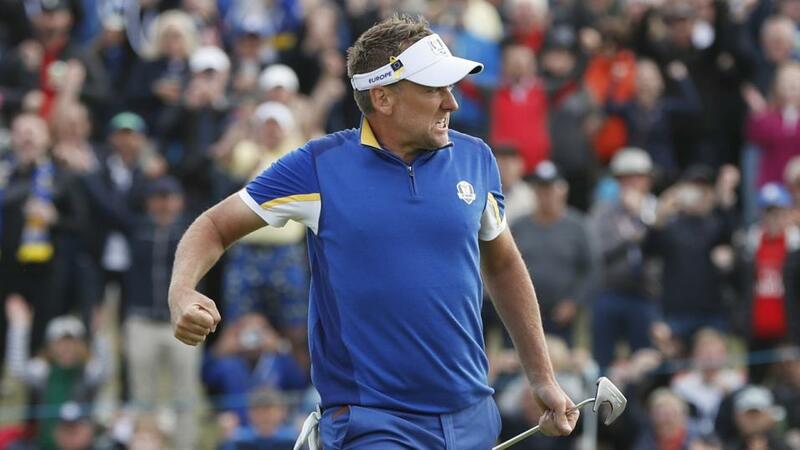 Almost inevitably it was Mr Ryder Cup himself, the Postman, Ian Poulter who effectively ensured Europe would regain the Ryder Cup. With Stenson on the 14th hole but guaranteed to win at least a half point, and Molinari and Sergio Garcia in similar positions, the contest was over, albeit unofficially, when Poulter defeated world number on Dustin Johnson on the 18th green. And just moments later, when Mickelson conceded defeat to the Open Champions Molinari, it became official. Europe had regained the Ryder Cup. Alex Noren and Bryson Dechambeau are the last men to tee off in the 2018 Ryder Cup. Europe lead the USA 10-6 but with all 12 Singles matches now on the course the projected score is 16-12 in Europe's favour. That Correct Score trades at [7.6], while the Europe win could be backed at [1.13] (USA [14.0], Tie [19.0]). With Rory McIlroy and Justin Thomas - the first match out - on the 14th green the projected score is massively in Europe's favour. Thomas Bjorn's men are up in seven matches, down in just two, and all-square in the other three meaning a 18.5-9.5 score is on the cards. But that is a tad deceiving as five of the matches Europe are up in are just by one hole. Europe [1.07], USA [24.0], Tie [26.0]. It's suddenly looking a lot tighter than the market suggests. Europe have drifted to [1.15] to win the Ryder Cup (USA [14.0], Tie [15.0]) but it feels like it's a lot closer than the 16-12 projected score. Four matches are all-square, but if they all went in the Aerican's favour then the match would end 14-14 and USA would retain the Ryder Cup. The first Singles match of the day ends and it goes in favour of Team USA on the 18th when Rory McIlroy's tee shot plugs in the face of a fairway bunker. He can't escape the sand with his first attempt and his second try (his third shot) finds water. Thomas' approach lands 10 feet away and that is effectively that. A sad end to a great tussle. Europe are suddenly out to [1.24] to win the Ryder Cup. Just minutes after Paul Casey and Brooks Koepka add a half point to their teams Webb Simpson earns a great scalp by beating Europe's number one Justin Rose and the USA are now just two points adrift. Further behind however matches have gotten a little better for Team Europe and the projected score is 15.5-12.5 and Bjorn's mean are back into [1.1] to win the Ryder Cup. The 15.5-12.5 Correct Score trades at [4.4] at this point. Little change in the markets here as Fleetwood was effectively dead and buried by the turn. Tony Finau springs a big surprise to get the better of one of Europe's stars of the week and Team USA are just a single point behind, but the projected score remains 15.5-12.5 in Europe's favour. Another match that has little impact on the market as European rookie Thorbjorn Olesen takes out Jordan Spieth 5&4, an outcome that looked very likely from quite early in the match. In the games still on the course the projected score keeps swaying between 16-12 and 15.5-12.5 in Europe's favour and it's no surprise to see them trading at just [1.02] to win the Ryder Cup. USA are out to [80.0], the same price at the tie. The Tiger is tamed, and in fairness he failed to roar all week. But take nothing away from John Rahm whose 2&1 victory over Tiger Woods ensured that every single member of Team Europe had contributed at least a point. The 16-12 Correct Score is now the marginal favourite at [3.4]. And that seemingly is that. Ian Poulter takes out world number one Dustin Johnson to take Europe to 13.5 points, but with Henrik Stenson guaranteed to claim at least a half point in his match and Molinari and Garcia in the same situation, Europe have regained the Ryder Cup. Mickelson's tee shot on the 16th finds water and he concedes the hole and the match to Molinari on the tee box, meaning Team Europe have regained the Ryder Cup.